Undoubtedly the most important and influential of the Soho coffee bars, in cultural terms, was the 2i’s at 59 Old Compton Street . Originally owned by three Iranian brothers and called the 3i’s, the name was dropped down an integer when one of them dropped out. Paul Lincoln had arrived in London from Australia in 1951, with very little cash and a desire to make more regular money than his occasional bouts of wrestling provided. As coffee bars began flourishing in Soho , Lincoln saw a possible business opportunity and, together with fellow Australian and wrestler Ray Hunter, he eventually managed to scrape together enough money to take over the 2i’s. The Irani brothers remained the landlords and the distinctive name was kept. In the spring of 1956 Lincoln and Hunter’s newly refurbished coffee bar opened. Despite being in the heart of Soho it started to lose money and the opening of a rival coffee bar next door named Heaven & HELL seemed to herald a hasty demise for the 2i’s. 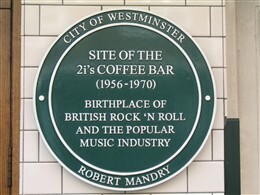 However, when Wally Whyton and the Vipers, popped into the bar for a coffee during the Soho Fair on 14 July1956 and decided to play a few numbers, the large crowd of enthusiastic listeners that soon gathered convinced Lincoln that live music could provide a lucrative sideline to hot drinks and orange juice. This chance encounter resulted in the Vipers establishing a residency in the tiny basement of the 2i’s. Whyton, who worked in advertising during the day, had formed a freelance business association and friendship with a former student of St Martin ’s School of Art , whom he asked to help redecorate the coffee bar and its grubby cellar. Lionel Bart covered the basement ceiling in black paint and painted large eyes (in punning reference to the bar’s name) on the walls, together with patterns of cubist shapes behind the small platform that served as a stage. The Vipers initially played for free drinks and spaghetti, but as their popularity grew they received tips and then a small weekly wage negotiated by Whyton. Paul Lincoln held audition nights to which youngsters would come from around the country, hoping for the chance to be talent-spotted. This had a double effect: as the 2-i’s became a haven for agents, managers and impresarios on the look-out for new talent to discover. Within months the names of the successful singers who had become household names after having initially appeared at the 2i’s included Marty Wilde (Reginald Smith), Terry Dene (Terence Williams), Vince Eager (Roy Taylor) and Billy Fury (Ronald Wycherley). Skiffle stars Chas McDevitt and Nancy Whiskey played at the 2i’s and the future pop careers of Adam Faith (Terry Nelhams) and Joe Brown (Joe Brown) were nurtured there. Guitarists Albert Lee and Ritchie Blackmore (later of Deep Purple and Rainbow) also served their apprenticeship in the cellar of the 2is. From the outside the building was unremarkable; the interior was clearly visible through the large plate glass window. Taking pride of place within the window and to the left of the entrance was a large, gleaming American jukebox . The front of the building above the window was dominated by a neon-lit hoarding that announced: THE WORLD FAMOUS 2i’s COFFEE BAR HOME OF THE STARS.” Beyond the glass door, with its chrome handle, the interior contained a serving counter to the left, with the inevitable coffee machine, an orange juice dispenser and a display case for sandwiches. To the right along the wall ran a Formica-covered shelf on which the customer could place an espresso coffee, served in a small Pyrex cup. The entrance to the cellar was directly ahead. If they intended to visit the basement, “customers had to descend a flight of steps and turn right into the narrow room at the bottom, where to the right again was a tiny stage opposite another almost vertical set of stairs that came out at street level. At the back of the room was a Coca Cola machine and another for dispensing orange squash. There was no air-conditioning; two flaps to the street were opened to let the air in from outside.” The official capacity of the thirty by ten foot cellar was eighty, although two hundred were often squeezed in to see popular performers. Both audience and bands were affected by the lack of space and ventilation. On busy nights, teenagers could be seen outside clustered around the open flaps of the delivery hatch listening to the music emanating from below. At the basement door stood the smartly dressed and Brylcreemed figure of Tom Littlewood, the cellar manager. He took the one shilling entrance fee from the expectant teenagers, many of whom had queued around the block to get in. He was also in charge of the remuneration of the musicians who performed at the 2i’s. Some acts, however, received nothing, as a gig there was seen by Littlewood as a major opportunity for them to be talent-spotted - at least that was what he told them. The fee he usually paid for a night’s gig, that could last from around seven to eleven o’clock, was eighteen shillings – one pound minus his two shilling “commission”. When Cliff Richard and the Drifters played at the 2i’s they were paid ten shillings to be split between them. The 2i’s can lay claim to be the crucible of British rock ‘n’ roll music, where many stars began their careers in the hot, sweaty cellar beneath an unremarkable coffee bar in Soho. Indeed some of them, such as Cliff Richard, are still performing and making records today. Inevitably a number of myths have accrued around this legendary venue, such as the one that Marc Bolan served coffee behind the bar. Bolan was a regular habitué and claimed to have met many future rock stars at the 2i’s, but he was never employed there. The 2i’s continued as a coffee bar until 1970 when it became part of Le Bistingo restaurant. In September 2006 a green plaque was unveiled on the exterior of the building by Sir Cliff Richard (various members of the Shadows and other stars of the skiffle scene were also present) commemorating the site’s seminal role in the development of Britain ’s highly influential rock and pop culture. This page was added by Tim Devitt on 30/03/2010. I found a picture of Old Compton Street that shows the 2i's, if it is of interest? I spent most of my teenage years at the 2 eyes coffee bar. Met and listend to most of the rock and roll stars those were the best years of my life just, sitting looking up and dreaming it was a small place down in the cellar but we never took much notice those were the days of good old rock and roll.